Classless Education is a collective of comedy writers and educators who believe that learning is something that should be a part of life, not apart from it. Ever since he was a child, David "Mr. Backwards" Fuhrer has had the rare ability to speak backwards as fast and as easily as others speak forwards. In this book, the author shows youngsters how to impress their peers - and confound their parents - by mastering this unusual skill. 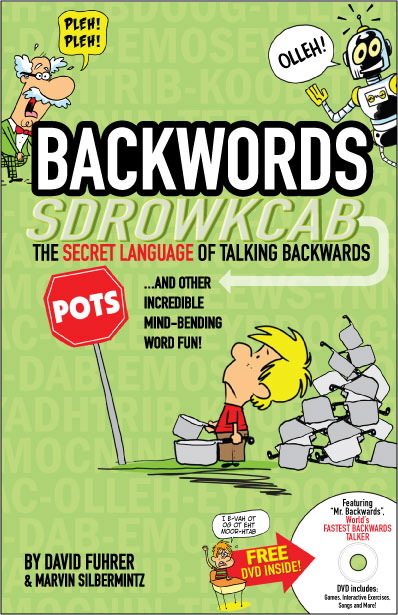 Backwords not only teaches the amazing art of speaking backwards, it reveals a world of crazy word jokes, trivia, cartoons and games that will amuse and amaze people of all ages including: Backwards talking and other secret languages to speak with your friends! Tongue Twisters to tangle your tonsils! Tips to win at Hangman every time! Hysterical anagrams and much, much more! Create a lifelong love of word and language fun with Backwords! The accompanying free DVD contains jaw-dropping demonstrations by Fuhrer, who garnered a Guinness World Record holder for fastest backwards talker. 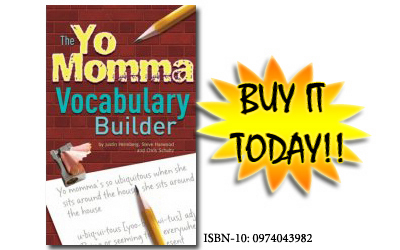 Also included are games, challenges and tips to master your backwards speaking skills. Yo Momma's so ubiquitous, when she sits around the house, she sits AROUND the house! Yo Momma's pits are so fetid, she slowed down Speed Stick! Each sesquipedalian snap is followed by a definition and explanation of word usage that humorously invokes pop culture phenomena ranging from NASCAR to the Olsen twins.